Using a calorie counter app is the easiest way to keep track of what food you eat. Calorie counter apps are one of the easiest ways to track your daily caloric intake from the food and drinks you consume. There are a variety of free and paid apps that let you log your caloric intake for iOS, Android, and Windows devices. Here are seven of the best calorie counting apps you should try. MyFitnessPal lets you log food manually or with your camera. MyFitnessPal is one of the most-popular calorie counter apps on both iOS and Android. As a result, it's updated on a very regular basis with new features and fresh additions to its 6 million+ food library. With MyFitnessPal, you can log food either manually or by scanning a barcode and the app even lets you create custom entries for your own recipes or café favorites to make logging them in the future more convenient. MyFitnessPal can sync to over 50 other apps and services. Supports Apple's iMessage for sending meal data. App provides food data entered by other users, which can be unreliable. Basic calorie counting is free, but more advanced features like the Nutrient Dashboard and additional goals require a $9.99 monthly membership. SparkPeople Calorie Tracker is half food log, half social network. SparkPeople Calorie Tracker is a free calorie counter app for iOS and Android devices that allows users to enter their food calorie information manually or by scanning a product's barcode with their device's camera. 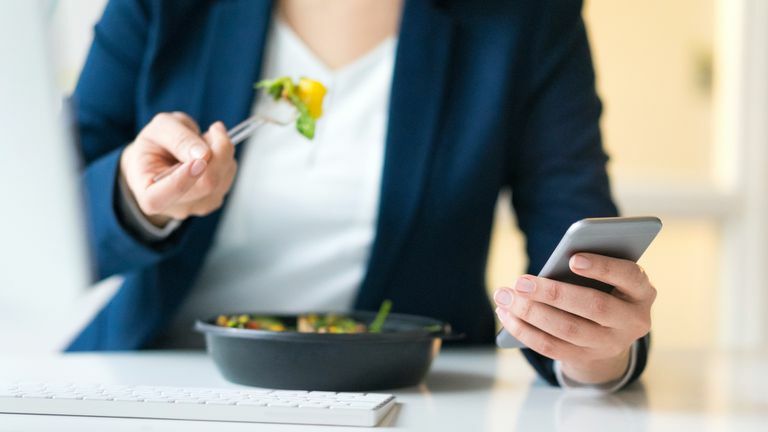 The SparkPeople Calorie Tracker app has a massive food database, meaning it has a higher chance of understanding any unusual meals you may enter. It's great for the foodie hipster who likes to eat something new every day. SparkPeople's social features also impress due to their potential to keep you motivated on your diet or lifestyle change. The app is available on the Apple Watch as well as the iPhone. Syncs data with Fitbit, MapMyFitness, Misfit, Runkeeper, Garmin, and Apple HealthKit. App freezes and crashed on older iOS devices. Detailed food calorie charts require a $4.99 monthly subscription. Food Diary is a free calorie counting app for Windows 10 devices. Food Diary is a free calorie counting app for Windows 10 PCs and tablets, and Windows Phones running Windows 10 Mobile. The app doesn't require any sort of membership to use, however, those wanting to back-up their data will need to create a free account with their email address. Adding food and drinks to Food Diary is fairly streamlined and its use of small icons for each food item in its database makes finding items much faster than similar apps. Food Diary can also send you reminders on your Windows 10 device to make sure you don't forget to log your latest meal. All app features work offline. Doesn't require any membership or personal information. Part of the food database requires a $14.95 quarterly subscription. Menu design takes some getting used to on PC. Available on: Windows 10 and Windows 10 Mobile. MyNetDiary boasts a wonderful visual design. The MyNetDiary calorie tracker is a beautifully designed app featuring a clean, easy-to-use user interface, clear icons in the food database, and a colorful dashboard that communicates all of your recent calorie data in one place. MyNetDiary's food calorie list contains over 600,000 food and drink items and entries can also be logged for free on the MyNetDiary website whenever an iOS or Android device is unavailable. Doesn’t require an account to use. Requires iOS 10 or later, which isn't supported on older Apple devices. Many basic features such as exporting data and adding food from previous entries require an $8.99 monthly subscription. Simple Diet Diary is the perfect calorie counting app for mature users. Simple Diet Diary is a free Android app that will appeal to mature users. The app focuses entirely on the logging of food and calories, which means it's significantly less cluttered and confusing than its rivals. Logging food or drink can be done immediately from Simple Diet Diary's main screen with the push of a button and previously entered items are pre-loaded for convenience. Very little assistance is needed when using this calorie counting app. Ability to export data as HTML, CSV, or SQLite is free. The food database is available offline. The option to view the Dark Theme is behind a $7 in-app purchase. The boring design will turn off younger users. Cronometer does a good job of counting calories and visualizing the data. Cronometer, also called CRON-O-Meter, is a brightly colored calorie counting app that focuses heavily on presenting collected data in an easy-to-understand way via the use of charts and icons. The main screen of the Cronometer app presents three circle charts that show the current number of calories consumed, target calorie progress, and calories burned, while a prominent plus symbol icon at the bottom of the screen lets you add food from almost anywhere in the app. Data syncs to the Apple Health App on iOS. A $5.99 monthly subscription is needed to remove ads. The strong emphasis on nutrients may overwhelm users who simply want to track basic calories. Calorie Counter by FatSecret renders effective charts of your caloric intake. Calorie Counter by FatSecret is an iOS and Android app that allows you to count the calories in food while also accessing charts that display your data in a way you can make sense of. Many similar apps require in-app purchases to unlock these sorts of features, but Calorie Counter by FatSecret offers everything for free. The app isn't as popular as its rivals, meaning not many people are using the community features. No way to hide additional food stats that can crowd the diary screen.